Southsea Waverley enjoyed double delight in Portsmouth & District League division one last week. The leaders beat hosts Priory by 19 shots on Monday before recording a 21-shot home win over Lee-on-the-Solent on Friday. And with closest rivals Alexandra suffering back-to-back defeats, Waverley have now strengthened their grip on top spot. The Southsea outfit’s win over Priory was led by John Biggs’ quartet. And the defeat of Lee owed much to the 11-shot wins on the rinks of Mark Hammond and Matt Marchant. Peter Gentry’s quartet prevented a whitewash with a five-shot victory. Alexandra were hoping to bounce back from a drubbing at the hands of Waverley the previous week. But they fell to a 15-shot defeat at Cowplain, despite winning on two rinks. The home side’s quartets led by Bryan Franklin and Graham King won by 18 and 13 respectively, to give their team victory. And Alex’s fortunes did not improve on Friday when they went down by four to Priory. Priory were 18 shots down and trailing on three rinks after 15 ends. However, they fought back to edge in front by the 19th and held on to win. Starring for Priory was Adrian Snook’s rink, which won by 10. Like Priory, Rowner endured a mixed week. They claimed a 21-shot win at Vospers, with Graeme Coles’ men in top form. But then crashed to a 24-shot home defeat to the resurgent Milton Park, who have now lifted themselves out of the bottom two. Gary Snook’s 15-shot victory was the best of the three winning Milton rinks. Park had started the week well, too. They recorded an 11-shot home win over Fareham, picking up 13 points in the process. Prior to their defeat at Waverley, Lee-on-the-Solent had inflicted a 42-shot defeat on Waterlooville. They won on three rinks, with Martin Ellis’ quartet adding the gloss with a 32-shot success. Waterloovile rebounded from that loss to beat Vospers by 32 shots on their own carpet, with Dave Baxter’s men leading the way. 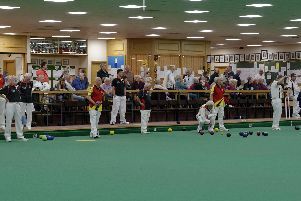 Fareham halted Cowplain’s winning run with a 54-shot home victory – led by big wins on the rinks of Cyril Friend and Dorian Bishop.